Chief Wole Olanipekun (SAN) is a foremost legal practitioner in Nigeria who has been practicing the profession for the past 42 years. Apart from excelling in his chosen profession, Olanipekun is also renowned for philanthropy as he has come to the rescue of many individuals and institutions with his milk of human kindness. 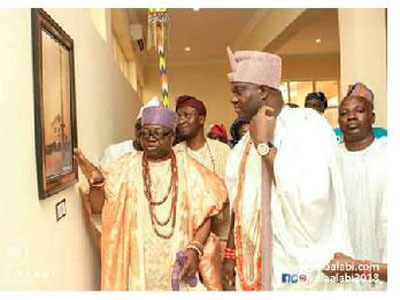 He was in his hometown, Ikere-Ekiti in Ekiti State, at the weekend to witness the inauguration of the town’s Hall of Fame, which was performed by the Ooni of Ife, Oba Adeyeye Ogunwusi. Olanipekun spoke with reporters on the project, community development efforts, his desire that the town produces the next Ekiti State governor, the slavery of Nigerian youths in Libya, among others. ODUNAYO OGUNMOLA recorded the conversation. What is your take on the commissioning of the new Ikere Hall of Fame at the palace of the Ogoga today? The Hall of Fame was constructed to celebrate achievements of Ikere indigenes all over the world where their pictures and exploits will be showcased for generations to come. Ikere has produced not less than 86 university professors and other accomplished individuals, enjoining indigenes to rally round their monarch to develop their hometown. When I was young about 60 years ago, my mother used to take me along to this palace here and I never remember an Ooni coming to Ikere to honor us as you (Ooni) have done today. At that time, it was Oba Adegoriola that was on the throne and we used to go there to see a peacock on the palace grounds then. But our Kabiyesi who is on the throne now (Oba Adejimi Adu Alagbado) single-handedly built a new ultramodern palace which has become a cynosure of all eyes and he motivated his friends to build an Administrative Block and now the Hall of Fame in this palace. I urged all Ikere sons and daughters to support our king. No more rancor, no more disunity, and no more acrimony. When I am doing these things, I believe I am doing them for the community I have seen a lot about Nigeria. Most of us, you saw it I Lagos, you journalists interview us; we are known in Lagos, we are known in Abuja. But there is no connectivity between us and our hometown, there is no continuity. How much more of connectivity, how much more of the nexus? To me, charity begins at home; you are journalists, you are talking about Ilorin. When I was in Ilorin, everybody knew that I was from Ikere but I am now in Lagos; everybody knows that it is my hometown. If you think you are not a good person at home, there is no way you can be championing the cause of transformation of your place of birth. Being the Asiwaju of the town, I need to rally everybody together to ensure that our hometown moves forward and develops. I believe that is a duty we owe our people because there is no place like home. Indigenes of the town are clamouring that Ikere is ripe for a university and since the monarch, Oba Adejimi Adu, ascended the throne, that is what the people have been clamouring for. As the Asiwaju of the town, what are you doing to ensure that, that dream becomes a reality? Ikere used to have a university, The University of Education, Ikere (TUNEDIK) which the then governor, ‘voluntarily’, submitted the licence. We didn’t like what he did and that is one area former Governor Segun Oni and I disagreed despite the fact that we are very close. That is a bygone and let bygones be bygones. Having a university is good, it’s a good idea; a committee has been set up and the committee is working but people are thinking that I, Wole Olanipekun, because my senior colleague, respected colleague, the Oluomo of Ado-Ekiti, Chief Afe Babalola, has a university maybe, I should also establish a university. I have told them, that I commend Chief Afe Babalola for establishing a university but everybody has his own assignment; everybody has got his own ministry. Don’t say because Mr A has done this, Mr B will also do the same. Don’t also succumb to any pressure from people. People are claamouring that, Wole Olanipekun, come and establish a university. But if I have the means, I will love to do so but it is not one of my objectives. When I was a Pro- Chancellor, I tried to do some things here and there and there are other things that I have done and that I am still doing, touching lives and impacting on people positively without necessarily establishing a university. But frankly speaking, I don’t even have the means, I don’t just have the means and even if I have the means, I don’t think I have the ability. I have the ability to other things but let me commend Chief Afe Babalola for running a university; running a university is not a picnic, establishing a university and running it is not easy. I have been Pro-Chancellor and now Pro-Chancellor again at the second university and I know what it means. Despite the fact that the University of Ibadan was established in 1948; as at today, the university still has a lot of teething problems. A university that was established almost 70 years ago still has teething problems and funding is not that easy. The gestation period of a university, for me, is not a question of 10 years; It is not a question of 20 years. If you don’t have the means, if you don’t have the resources and what will sustain that university in five years time and even after that time, there will be problems. I don’t have that type of resources; notwithstanding I commend Nigerians like Chief Afe Babalola who have the means, who have the patience, who have the ability, who have the comportment and who have the patience to run private universities. For Ikere, I am supporting the committee, not that I will take over the enterprise as Wole Olanipekun. I give you another example; at Ajayi Crowther University (where I now serve as Pro-Chancellor), is an Anglican University, there is no subvention. What we are doing is to call on Anglicans who have the means, come and subscribe to the running of the university without you taking any dividend for now. We are calling on them to come and execute legacy projects, legacy enterprises and I am going to be part of it. For that of Ikere, I will be part of it. Looking at the way Nigerians are being treated abroad in places like South Africa, China and now Libya where they are being inhumanely treated. Do you think the government is doing enough to protect them? It’s shame you know, you know what people went through during the slave trade. At this period of human involvement, Nigerians still travel abroad, the routes that our people take. Very torturous, very winding, very dangerous, very daring; they don’t even mind if the ship they are travelling in capsizes. Why are they leaving? Some people just believe that ‘let me leave Nigeria,’ but when you ask ‘why are you leaving Nigeria?’ They believe the Golden Fleece is somewhere else and that the greener pasture is somewhere else, outside Nigeria. Even at Cotonou, even at Cameroun, even in the Niger Republic, even in the Chad Republic, why? I pity our young people; when we left school, when I left the University of Lagos in 1975, despite the fact that I still had one year to go to the Law School compulsorily, as a law graduate without going to the Law School, I had not less than five job offers and when I left the Law School, I still remember, I had appointment letters to be a state counsel at Akure at the Ministry of Justice. I had at Federal Ministry of Justice. I had at the Police. I had with the Customs. I had with the Immigration. I was appointed to be the pioneer Secretary of the Odua Conglomerate, amongst others, but I chose to go into private law practice. When I was in school as a student, from this Ikere, I was living like a king at the University of Lagos. I was in Mariere Hall; when I was staying there, we labeled it Ikoyi, I was a student union leader, my parents weren’t that rich but (Gen. Adeyinka) Adebayo was giving every student from the old Western State £100 as a bursary. At the same time, I still remember that you will be given a loan at Aguda in Surulere, you will sign that you are going to pay, nobody will ask you after you leave school. This was to encourage us; they were giving us a loan, the Federal Government made up its mind that they would not ask anybody. I doubt if anybody paid a dime, nobody asked me anyway; even as a student from a relatively poor home, from an average home, very average, I was travelling abroad. But today, nobody sympathizes with our youths. Look, when you look at a lot of people that are here now, somebody was whispering to me as I wanted to eat because I had my first meal for the day just now; as I was about entering, one lady said Sir, Asiwaju, I have just completed my PhD. When I entered the hall, this chapel, another one came and said ‘for the past two years, I have completed my PhD, I don’t have anything.’ Most of the parents who came here, despite the fact that they have all been refreshed, they came here to whisper to me that their children, their wards, they don’t have anything to do. This is my own nephew, he is taking to this job (camera man) now because he is a graduate of a polytechnic for the past five, six years, nothing for him to do. I had to set him up to go and do this. Now, you can see the fate or can I say ill-fate of the youths nowadays? Those of us who are privileged, we are selfish, we are greedy, we are not considerate. Those of us who are successful, we are leaving everything to government and we are not pleading with government, ‘let us consider what is happening to our youths.’ They are miserable; that is the word, miserable. When you say okay, there is no hope of tomorrow, that is what is pushing many of them to Libya. Libya, for goodness sake, what is in Libya that a Nigerian will want to go to? Libya had just passed through the dictatorship of Muammar Ghaddafi, what is there? No freedom, nothing. But they believe that anywhere else will do except Nigeria and we are all bemoaning the dehumanizing nature of our own people there. How can we stop it? We are not saying that these people should not escape to Libya tomorrow; don’t go to Cote d’Ivoire next week, nobody can do that. Let us create employment opportunities, employment opportunities can be created in diverse ways. Government can encourage middle scale or small scale enterprises for our youths. But nobody is saying this, we deceive ourselves. We also have another problem in Nigeria, which is the Federal Government. The Federal Government does not allow the private sector to blossom; when the private sector blossoms and does well, when the private sector employs and yields dividends, you don’t think so much about the private sector. How do I mean? How many people does the government of the United States employ? How many people? Few but we hear (President Donald) Trump, one thing he parrots is that we have been able to create so…so number of employment. When he was sworn in, he was trying to create employment, not within the federal bureaucracy but creating employment in the private sector. Don’t muzzle the private sector; that is what is happening here, the private sector is being muzzled. That is why the private sector in Nigeria is getting stunted and when the private sector is not complementing what the public sector is doing, then we have a problem. I am not a unionist, I don’t know how to classify the Nigerian economy, an economy that is zeroed in on federal budget, an economy that is so monolithic, an economy that is so narrow, so personalized. For you now, you cannot do your business if the President has not signed the budget; your own success as a private entrepreneur would depend on the success of the implementation or the otherwise of the budget. You see the members of the National Assembly saying that the 2017 Budget, the performance level, has been about 20 per cent. Everything will dovetail negatively and impact negatively on the private sector and will also affect the ability of the private sector to employ people. But the summary of it is this; if we don’t take care of our youths, if you don’t sympathize with them, if you don’t empathize with them and you don’t create employment for them, you are directly or indirectly, advertently or inadvertently, planting a revolution for the future. Because when you have people, lawyers, doctors, accountants, all of them graduates without gainful employment, then that is a recipe for revolution. That is why they go to Libya; that is why they go to Cameroun; they go everywhere to escape from Nigeria.